The prestigious Taipei Folk Dance Group delivered a phenomenal performance at the Peace Memorial Hall on Sunday, August 27 to the persons who attended the show. Choreographer Wei-Ren Lee did an excellent job at guiding his students to give performances in segments such as, “Meditation Through the Flower” which referred to the story of Buddha and his hand gestures which hold the secrets to life, and the “Rukai Wedding” which had intricate dance moves that were very romantic. But many patrons held on to their seats when the dancers of the Taipei Folk Dance Theatre performed a Kung Fu segment with swords and simple sticks that pierced the air. Minister of Culture Rene Baptiste who presented several tokens to Lee on behalf of the people of St.Vincent and the Grenadines expressed the desire of one day taking a local dance contingent to Taiwan to share experiences. 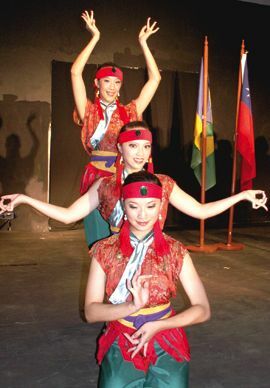 The Taipei Folk Dance Theatre which is on a Caribbean tour was founded in 1989 by Professor Tsai Li- Hua. It is the first professional ethnic Dance Company in Taiwan and aims to promote and preserve the Taiwanese culture.